Vibrating sample magnetometers measure residual fl ux density, coercive force, and maximum energy product. 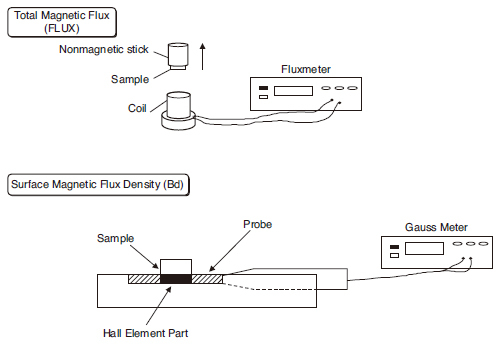 Flux meters are often used for measuring total fl ux and gauss meters are often used for measuring surface fl ux density. Calibration of search coils and hole probes is essential for these measurements. The following two methods are generally used for calibration. Measure and select the best calibration. Calibrate, using a high-accuracy standard sample. We recommend using a standard sample when setting magnetic characteristics.